**This post is part of the Get Real series. Please remember that this is meant as a learning community. We know that many of you are passionate about what you do and we want you to express that, just please do so in a way that will be an encouragement and aid to others making a transition. We want this to be a “safe space” for participants to learn. For that reason, we reserve the right to delete any comments that are not handled in this manner. We have invited all of you along on our Get Real journey on which we learn how to eat REAL food. We have partnered with several other bloggers to put research and resources before you, and then give you an action step to help you transition out of processed foods and into a real or whole food lifestyle. If you are just getting started, you can use this round up post to guide you week-by-week through a year of topics on eating wholesome, nutritious, REAL food. It isn’t so hard to make big changes when you take it one baby step at a time! 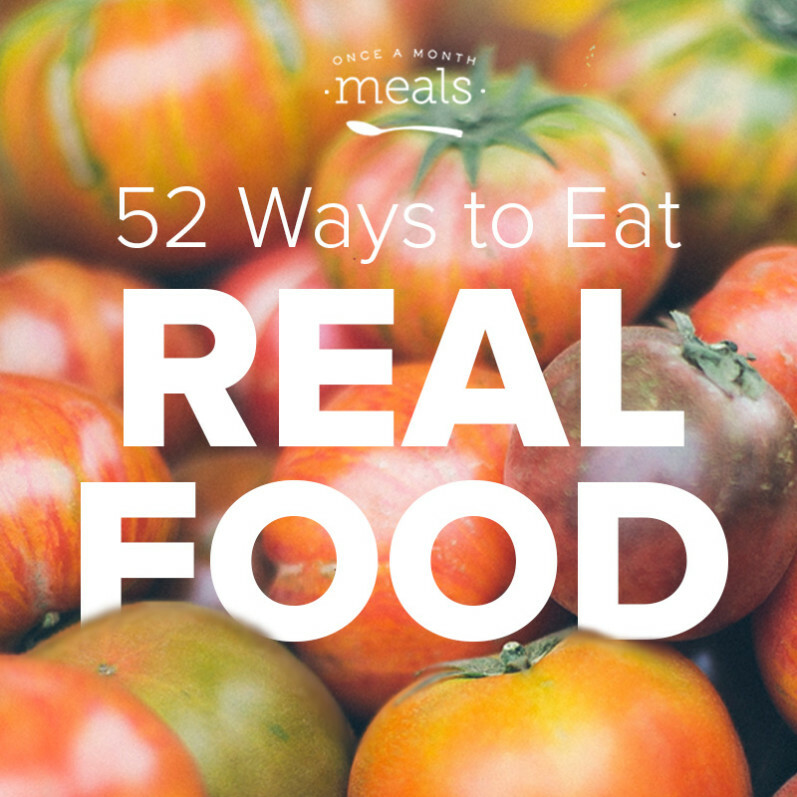 Follow these 52 ways to eat real food and reach your goal by the end of the year! Break some old habits and create some new habits. Discover where and how to start eating REAL food. Watch the movie Food Inc. and react. Be inspired by others’ journeys. Make your own pizza dough, tortillas, and sweet breads. Make your own sandwich and artisan breads, and cereals. Learn about the benefits of whole grains. Learn about gluten-free whole grains. Learn the basics of noodles and make your own. Make your own egg noodles. Make your own potato gnocchis. Consult the Dirty Dozen list when selecting produce. Grow your own edible garden. Grow your own container garden. Check out Don’t Compost It, Cook It! Be an educated pork consumer. Be an educated beef consumer. Learn about whole foods meat alternatives. Learn how to purchase local grass-fed beef. Be an educated egg consumer. Be an educated milk consumer. Learn to make your own cultured dairy; including sour cream, yogurt, and cream cheese. Learn about real butter and cheese. Take advantage of the versatility and goodness of coconut oil. Learn to save money as you eat more whole foods. Learn more ways to save on buying food as you Get Real. Learn why canning and freezing your whole foods are the way to go. Learn basic tips for beginning canners. Learn the difference between water bath canning versus pressure canning. Learn why sometimes freezing can be better than canning. Be an educated chicken consumer. Learn how to cut a whole chicken and how to make chicken stock. Discover the pros and cons of raising your own backyard chickens. Discover how to begin raising your own backyard chickens. Try your hand at some real food remedies. Clean your home naturally, without synthetic chemicals. Consider the benefits of using glass as opposed to plastic. Educate yourself about beans, rice, and grains. Educate yourself about the different kinds of rice. Consider eating more beans and legumes. Learn the difference between dried beans and canned beans. Assess your journey to Get Real. Learn about whole foods as a cancer preventative. Be inspired by others’ journeys to Get Real.